She has now produced over 133 tonnes lifetime in six lactations. 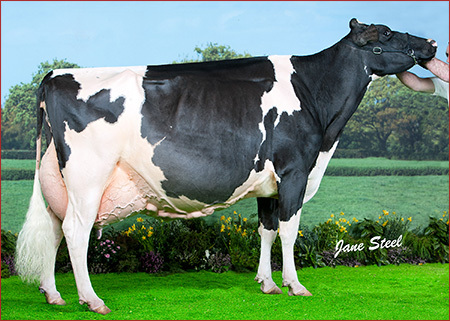 Her first daughter by Shottle sold at our Open Day Sale 2010 for 5400gns to Designer Holsteins. She is now classified Ex96-3E and stood champion at Kent County and Bucks County Shows 2013 and South of England Show 2014. She has daughters in the herd, Richaven Windbrook Adrienne 2 Ex91, Richaven Doorman Adrienne 2 VG88 3yr. And, she has sisters Richaven Windbrook Adrienne 2 and Richaven Windbrook Adrienne 3, both of this are currently in their third lactations and recently scored Ex92. She has given over 85 tonnes lifetime yield in seven lactations so far. She produced over 97 tonnes lifetime in five lactations.